A few months back I declared the Peak Design Everyday Backpack the best thing at CES 2018. It was a silly comment since the bag was released a couple years back but it was new to me. I had purchased the bag from Best Buy a few days prior and was in love with the bag and had to tell the world. I’m happy to report that after carrying the bag around several more conferences and a family trip to Disney World, I’m comfortable declaring it the best backpack I’ve ever used. The company recently released a black version and sent me one to test. It looks mean. It’s the backpack Darth Vader would carry if he needed to tout around a full frame DSLR, a couple lenses and a MacBook Pro. The bag’s main clasp is wonderful. It’s designed in such a way that the wearer can quickly open and securely close it. Just pull down and away to open the bag. To close it, pull down so the top is tight, place the clasp next to the metal rungs and let go. Magnets hold the clasp next to the bag and the tension on the top causes the clasp to find the next available rung. Try it and you’ll love it. I do. Peak Design equipped the bag with solid hardware. All the clasps are metal and the zippers are durable. I don’t think there’s plastic anywhere on the bag. Like I said several months ago, the bag is best described as smart and solid. It’s a confident design with just enough pockets and storage options. The bag features one, large pocket that makes up most of the bag. Foldable dividers allow the wearer to customize the bag as needed. And quickly, too. These dividers fold in several ways, allowing the bag to hold, say, a large telephoto lens or several smaller lens. The bag is packed full of surprises, too. Straps are hidden throughout allowing it to hold a surprising amount of items even a drone. Peak Design positions this bag as a camera bag, but it can be so much more with some little bags. I use these and they fit perfectly in both the 20L and 30L bag. It lets me keep things organized and separated in a way that I’ve haven’t found possible in other bags. Peak Design should look at making a series of these bags. I would be all over them if they did. The bag I bought back before CES was the 20L. It’s the smallest option though far from small. 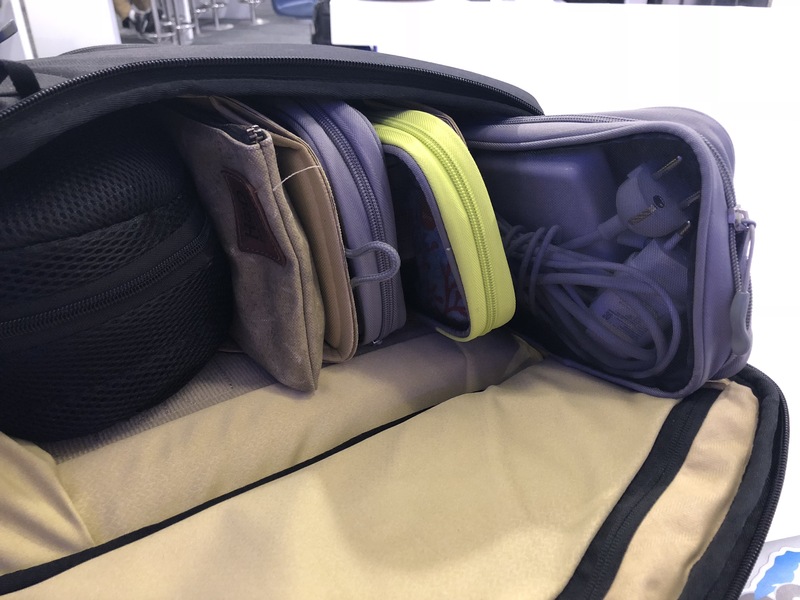 My 15-inch MacBook Pro squeezes into the laptop compartment and the bag has yet to feel too small even when it’s holding a camera, a couple books and a travel pillow. The new black bag looks amazing but it seems to show scuffs and dirt more than my grey one. That’s a shame, too. I throw my bags around and expect a lot out of them. This black bag looks more dirty after one oversea trip than my grey one does after six months of use. Just like I said back at CES, I’m not going to run through all the details of this bag. A few more are worth calling out: The sternum strap is fantastic. It uses clips without moving parts so it should last a lifetime. The shoulder straps are attached to the bag with a rivet that allows the straps to swivel as needed — it’s a smart advancement in the design of a backpack. And inside the laptop sleeve is a small pocket that is absolutely perfect to hold a Traveler’s Notebook and a pen. As backpacks go, the Peak Design Everyday Backpack costs more than most. The smaller 20L is $260 and the 30L is $290. To me, the higher price is justified and if there’s a backpack worth the extra cost, it’s this one. I highly recommend this bag. Folks, it’s Bag Week! Tito Hamze visits Peak Design’s HQ in San Francisco to learn about the company and how they create their bags. From humble beginnings starting with a clip to hold your camera to a full-fledged accessory company, this outfit is growing and creating quality products — all while never having taken any traditional VC funding.